With the first arc out of the way, 'Betty and Veronica: Vixens' has established its Riverdale biker gang as the real deal. The one-time group of frenemies has bonded into one fearless vigilante force dispensing justice all over town. Now, their exploits have attracted some unwarranted attention from a shady character. What's made this one of my favorite titles of the year is the commitment by writer Jamie Lee Rotante to show that Betty, Veronica, and their schoolmates are truly some badass leather-clad biker chicks. 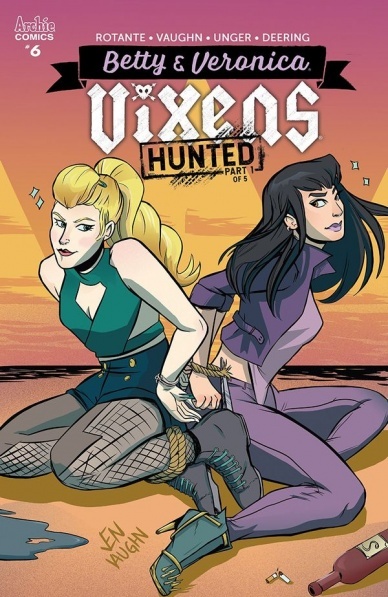 It would have been easy to dismiss the premise of 'Vixens' when it was previewed that this would be more of a comedic spoof in an alternative storyline than to see them fully realized as a legitimate force to be reckoned with. And so far they've proven to be the real deal willing to throw down with whomever to protect others. All those rumbles against bullies, domestic abusers, and Southside Serpents has brought them some notoriety and drawn the attention of one mysterious character in particular. Doc approaches them trying to convince them that he's on their side and not the stalker they think he is. They're not convinced and they quickly dismiss him. His motives may not be that amicable after all. Elsewhere, Cheryl recounts what she did with the leader of the Serpents and a kidnapping has the town on edge. Rotante is leading this new storyline into some much darker themes and crimes. It was all fun and games at first but Doc makes the Serpents look like a Boy Scout troop. Luckily, Cheryl begins to emerge as a wildcard who's just as cunning and smart as any of them. This raises the stakes exponentially for the Vixens with a new viable threat but they seem as determined as ever to stick together and fight injustice. Taking over for Eva Cabrera on art is Jen Vaughn. Vaughan's style is more traditional than Cabrera's with clean lines and more angular character designs. It takes some getting used to as Cabrera established the initial look of the 'Vixens' with a more cartoony rockabilly-influenced look. The series still looks great just in a different way. Elaina Unger remains on colors so the rich pastel tones continue to influence the sometimes ominous mood. 'Betty and Veronica: Vixens' takes a darker turn as a new threat emerges ready to turn the town upside down. The Vixens muddle through some discourse among themselves only to find themselves even stronger when Cheryl proves her worth. The time for games is over as 'Vixens' face some seriously dangerous forces. If you like your Archie characters mixed with the crime drama of 'Sons of Anarchy' then this is the series for you. Gird up your loins for this one.